You are at:Home»Archive for "Datura"
Datura is a genus of nine species of poisonous vespertine flowering plants belonging to the family Solanaceae. They are commonly known as Daturas, but also known as Devil’s Trumpets. Its distribution within the Americas and North Africa, however, is most likely restricted to the United States, Mexico and Southern Canada in North America, and Tunisia in Africa where the highest species diversity occurs. 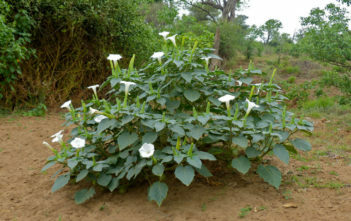 The name is taken from Sanskrit “dhatūra”, meaning “thorn-apple”.